Expatriate author Peter Walker is the next New Zealand Writer in Residence at Wellington’s Randell Cottage for 2011. Peter Walker works as a journalist in London, and is the author of the historical memoir The Fox Boy (Bloomsbury 2001) set in Taranaki, and a novel, The Courier’s Tale (Bloomsbury 2010), set in the court of King Henry VIII. He began work on the Dominion in 1976 before leaving Wellington to work in Australia, then moved to the UK in 1986 to work for newspapers that included the Independent and Independent on Sunday, where he was Foreign Editor. He has also written for the Financial Times and Granta. 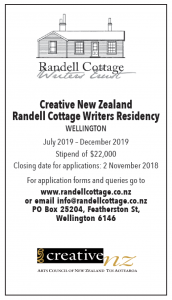 Peter Walker will use his six months in Randell Cottage to work on completing a novel provisionally entitled The Watcher’s Diving, which is set in NZ, the US, India and Lebanon. He will take up his position in April 2011.